Few roadside attractions garner immediate attention the way ones boasting “World’s Largest…” or “World’s Longest…” do. 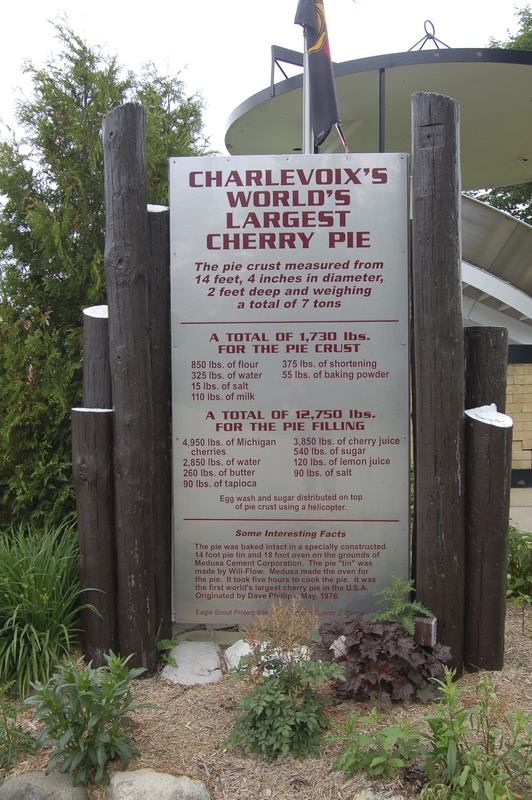 Charlevoix, Michigan is home to such a monument, as a large pie tin on the side of US-31 pays tribute to what was at one time the World’s Largest Cherry Pie. 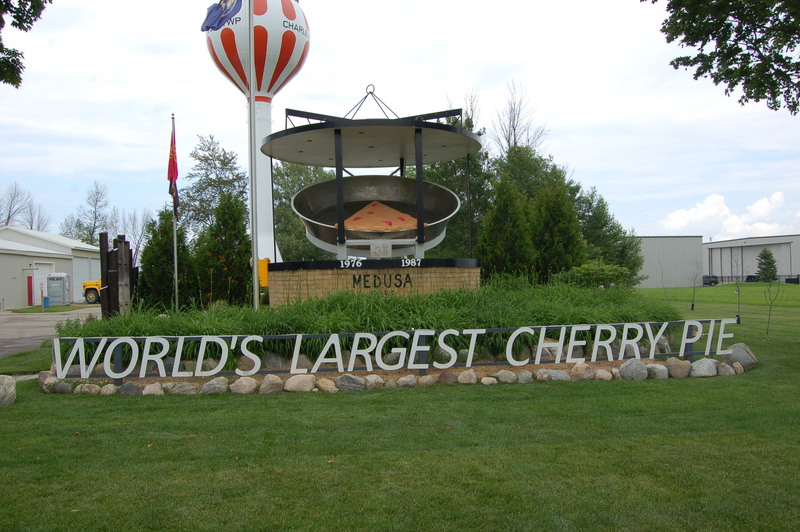 In 1976, the world’s largest cherry pie was baked during the annual cherry festival. 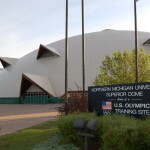 A giant pan and a very large oven had to be constructed and the final result was a pie that weighed 17,420 pounds. 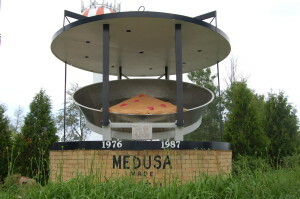 The Medusa Cement Corporation was responsible for the oven the pie was baked in, which is why “Medusa” appears in large letter on the monument. 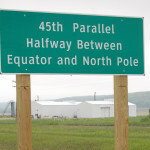 The information sign shown above gives even more details about the pie. 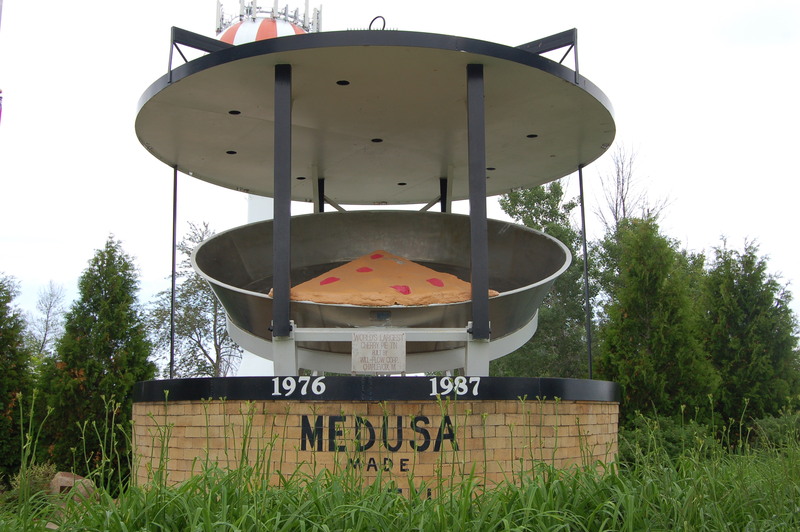 The monument even features a fake slice of pie, and was spruced up in 2008-09 as part of an Eagle Scout project. Charlevoix had the record until 1987, when Traverse City topped it (Both have since been surpassed by a Canadian pie). 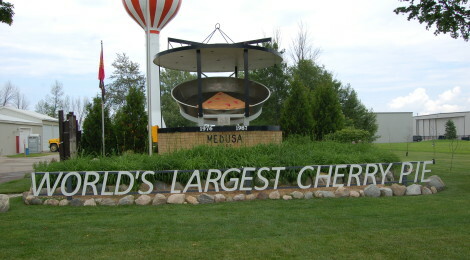 Both pies made our first list of “Big in Michigan” things, and look for the Traverse City pie tin to be featured soon. As far as roadside monuments go, though, this one really delivers – stop by 6591 S. US-31 and see it for yourself! 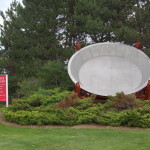 You can learn more about the battle between Charlevoix and Traverse City as well as the Canadian pie that outdid both of them at roadsideamerica.com.